I never really realised before, but the introduction of stands really just turned Jojo into a villain of the day anime. I don’t really remember that being the case during the first two parts, but I got through all of parts 3 and 4 without really noticing it. So I can’t really say I mind. The last handful of episodes of the series have primarily been there to introduce us to the gang, their personalities and their stand powers. Aside from that though, It’s been about fighting off the hoards of enemy stand users. Standard fare. 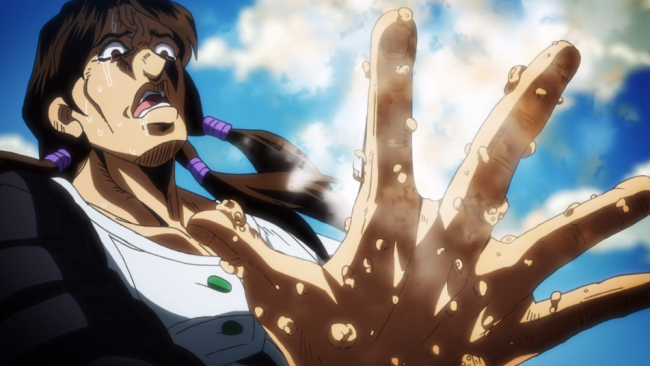 In episode 13, we’re returned to the battle in progress between Pannacotta Fugo and Illuso, the reason behind I can’t rightly remember. They want a key, which has something to with the Boss’s daughter, I know that much. They want the key, I feel like that’s the main take away, and ultimately irrelevant to the events of the episode. As usual, it took all of my concentration to keep up with the nonsense going on in this fight. In classically convoluted style, characters slowly reveal their stand powers to one another before announcing they were one step ahead of their opponent the whole time. Unfortunately, I’m still stumbling at step one while the villain is Nani? !ing in disbelief. I’m 13 episodes in and I’m still not really 100% on what Giorno’s stand actually does. It turns inanimate objects into living things, either plants or fully sentient animals, then if those creations are attacked, the damage is returned to the attacker. Sure. But then if he punches someone with his stand, they have an out of body experience and perceive time differently? Plus, his whole stunt with the brick snake and the finger punching blood into his chest to make him immune to a deadly flesh eating virus… It makes me remember that I really shouldn’t be trying to make sense of the events of this series and just enjoy the whole crazy train (which, coincidentally would be my stand’s name). What I have realised though is that in the past few episodes, very little has happened. Aside from us learning each of the gang’s personalities and stand abilities, which are far more brutal in nature compared to Diamond is Unbreakable, where everyone, aside from the major villain, didn’t really have any murderous intent. In fact they were all just friends just waiting to be made. 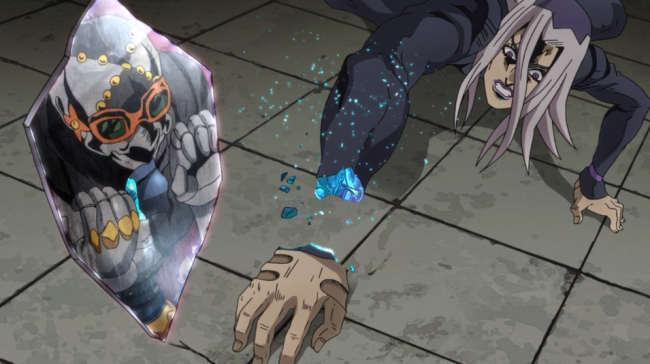 Golden Wind feels a lot more like part 3 in the battles really are life or death situations, and they haven’t got the get out of jail free card that is Crazy Diamond. To get off track even more: it makes me realise that Jojo is the antithesis to HunterXhunter when it comes to the consistency with its characters powers. The own downside to Jojo is that I can never feel smart in trying to figure out how the characters will deal with the situations thrown at them. More often than not they pull some new thing into the fight that wasn’t a factor until they revealed it, helping them save the day. Although I suppose it wasn’t much different when Jotaro’s solution to every problem was to punch it real hard, and if that didn’t work, he’d punch it real hard lots. It might sound like I’m down on this but I’m not. We’re still in the early parts of the series, introducing the characters and the main story line that will run throughout. It’s a shame there wasn’t a real episode this week. 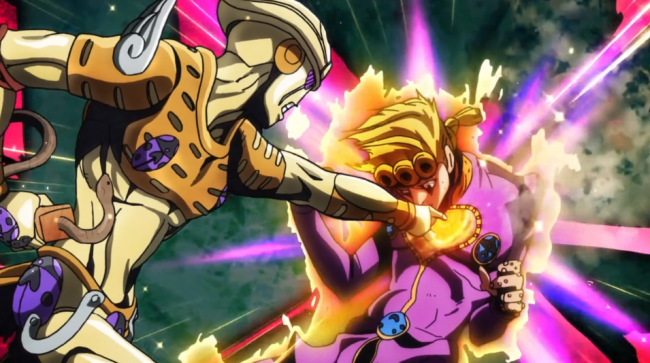 Posted on January 9, 2019 January 8, 2019 by WooderonPosted in Anime, Condensed Reviews:Tagged Anime, Giorno Giovanna, golden experience, jojo, jojo’s bizarre adventure, Pannacotta Fugo, purple haze.